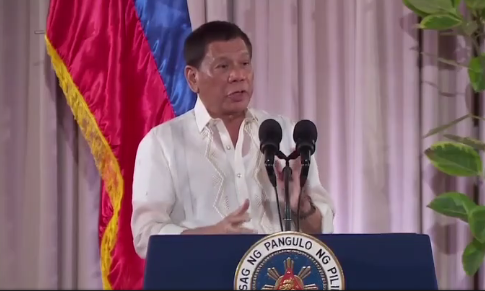 In a speech at the Volunteers Against Crime and Corruption's (VACC) 19th anniversary, President Rodrigo Duterte said security forces should shoot Commission on Human Rights personnel if they are found to be obstructing justice. President Duterte slammed the CHR for making "so much noise" even if their powers are only supposedly recommendatory. "They can write anything. Condemn the police, condemn everybody, pagdating ng recommendation, wala naman," he said. “One of these days, kayong human rights, kayong imbestigahan ko. Conspiracy. If they are obstructing justice, you shoot them,” Duterte said. The President said the police should shoot CHR personnel to see which side they will be protecting. "Sabihin mo pulis, barilin mo na yang kasali diyan. If they are obstructing justice, you shoot them. Para makita talaga kung anong klaseng human right..."
"Galit ako sa inyo. Because hindi niyo tinitimpla kung anong klaseng papasukan ninyo. Basta human rights. Eh ilang biktima na dito?" He again returned to his usual refrain against the government body, saying that it is not protecting nor advocating for the rights of crime victims and government personnel. “Basta human rights, ilang biktima na rito. Yung lima na namatay, yung one-year-old na ginulgol doon. Yung human rights na yan nasaan? They could not even utter it in public na, ‘Look, do not do that to me.’ Ganito 'yan e,” he said. Duterte earlier threatened to abolish CHR and said he will not allow cops and soldiers to be investigated by the agency.